Well, I tried hunting down this Anjou / Bosc pears that was originally stated in the recipe, but I couldn’t find them at all. 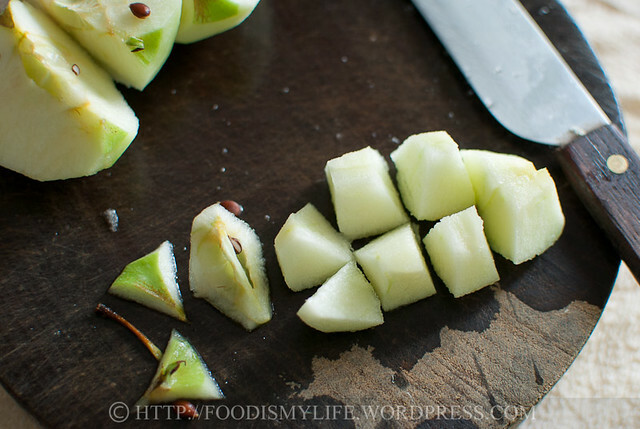 On the other hand, there were so many other types of pears to choose from that made me so lost and confused, so I decided to just use Granny Smith apples instead. 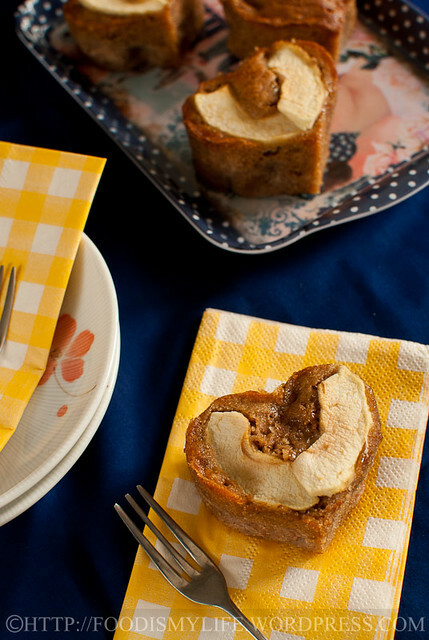 As for the pinwheel part, I baked only 1/2 of the recipe and though I could have baked it in a very tiny pan, I saw my heart-shaped silicon mould lying in the back of my cupboard… (the last time I used it was like… probably a year or more ago?!) 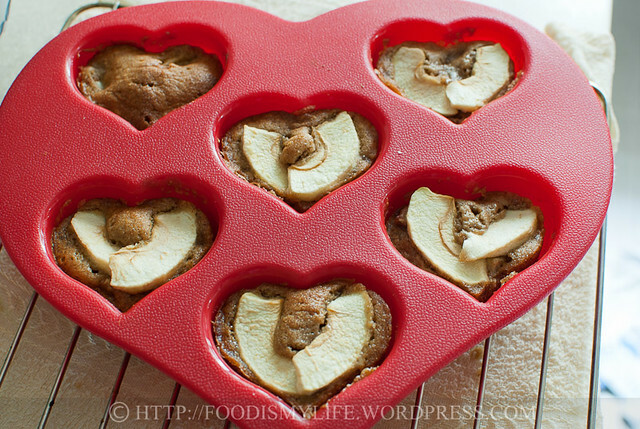 So heart-shape cakes they became! 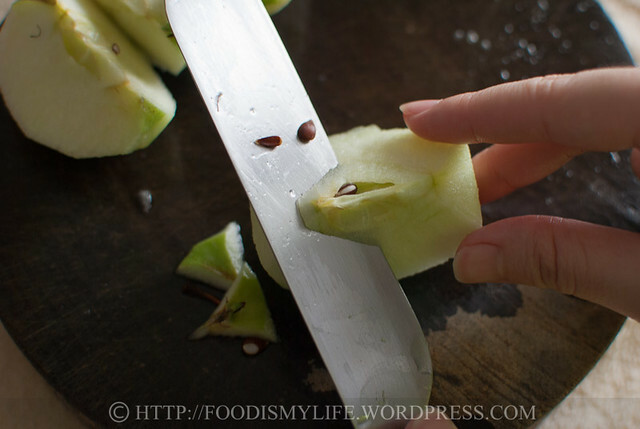 Making this cake is definitely not difficult, just that extra time is needed to toast and grind the nuts and peel, core and slice the apples. I decided to mix in huge chunks of apples into the cake, hoping to give it a more apple taste. The resulting cake is sweet, sour, nutty and cinnamon-y at the same time. The hazelnut taste really came through very strongly in the cake and the apples lend the cake a nice sweet and sour taste. The cinnamon’s a bit too strong for my mom but I quite liked the overall taste. 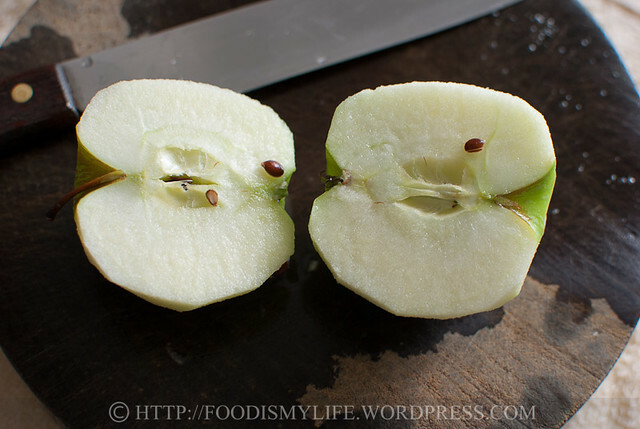 The apples that are mixed inside are very soft and mushy, while the ones on top are slightly firmer. The cakes are also very, very moist, probably a bit too moist for me. Overall, I like the cake base because it’s easy and very nutty (I would try substituting with other nuts in the future), but I would probably swap out the apples for berries or chocolate (imagine hazelnut and nutella!) the next time I bake them. And now for the step-by-step photos! 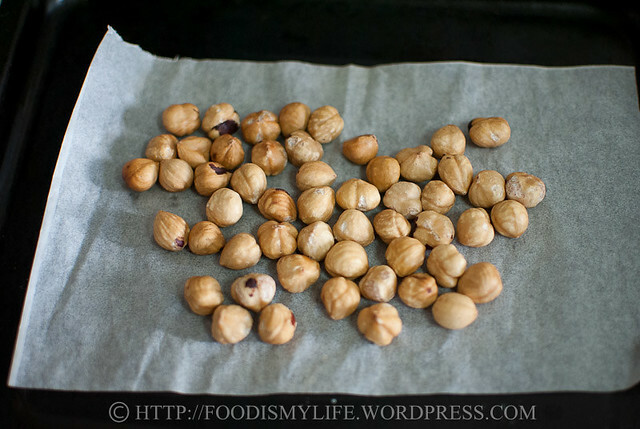 Toast the hazelnuts in a 180 degrees Celsius oven for 10 minutes. 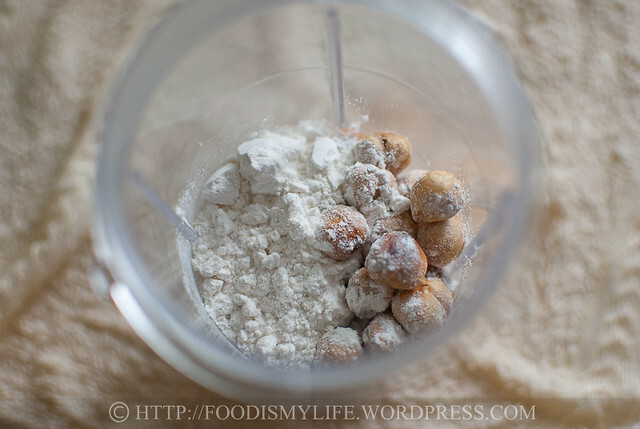 Let the toasted nuts cool completely and combine it with some flour in a food processor. Pulse the nuts until they are powdery. 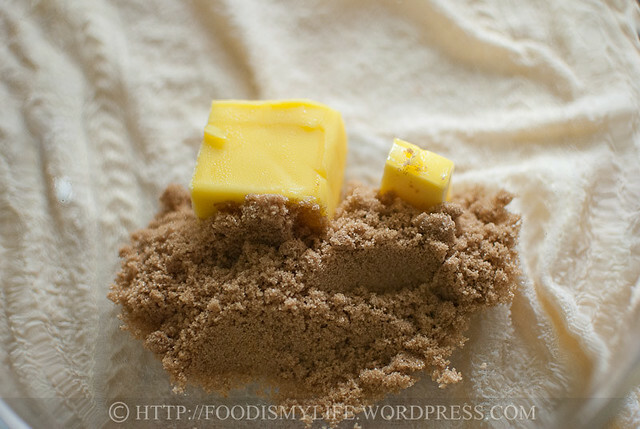 In a mixing bowl, combine brown sugar and some room temperature unsalted butter. 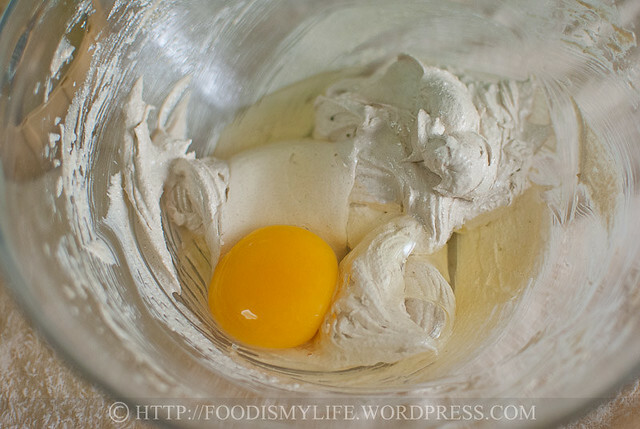 Beat with an electric mixer and add in 1 egg. Beat again until the egg has been fully incorporated then dump in the nut-flour mixture. 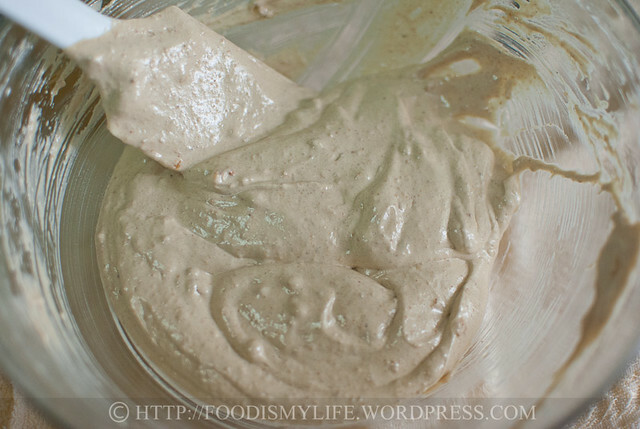 Fold until fully incorporated – the mixture will be slightly lumpy if your nuts are not fine enough, but no worries! 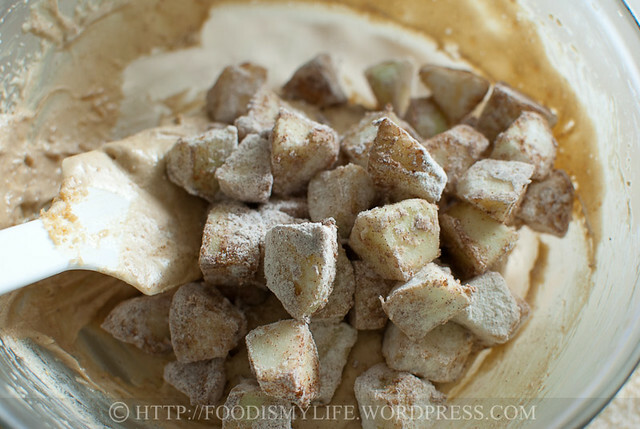 Refrigerate the batter while you prepare the apples. 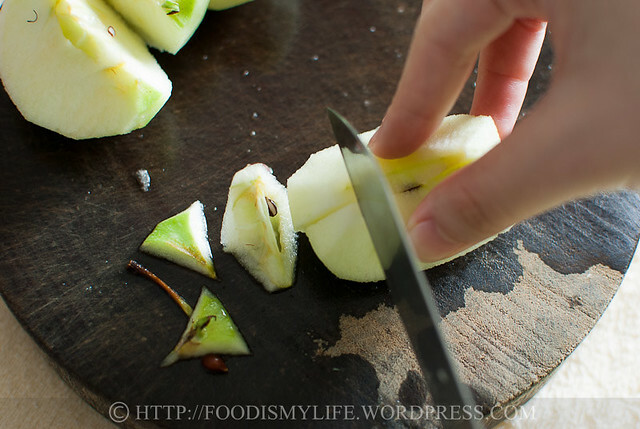 Place the knife at a diagonal at the core of the apple and gently slice it in halfway. 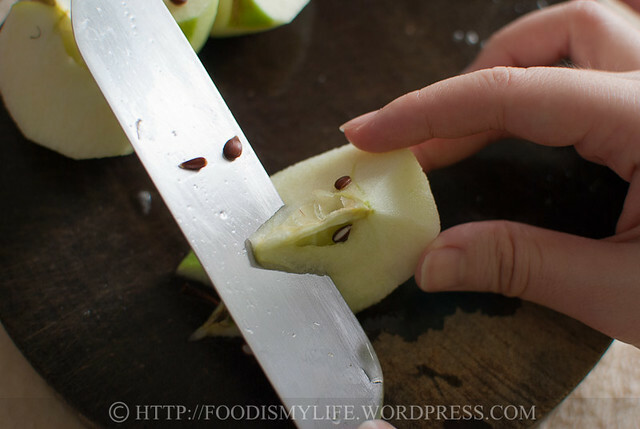 Turn the apple 180 degrees and do the same thing, then twist the knife upwards and the core should come out easily. … Then turn it 90 degrees and dice it. 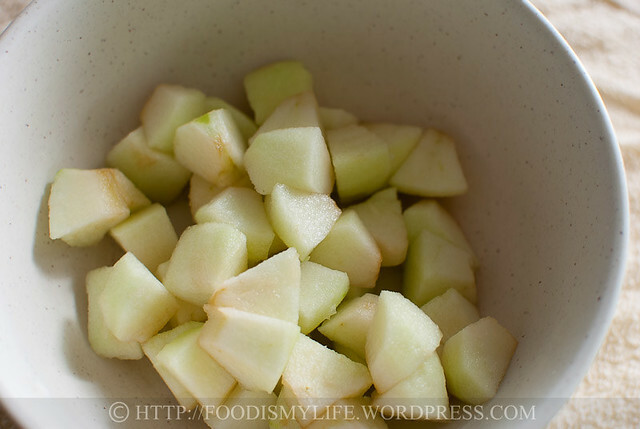 Place the diced apples in a small bowl. 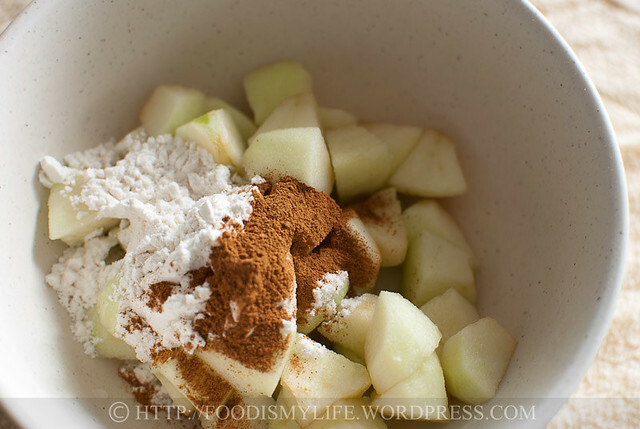 Add in flour and cinnamon and toss to coat. 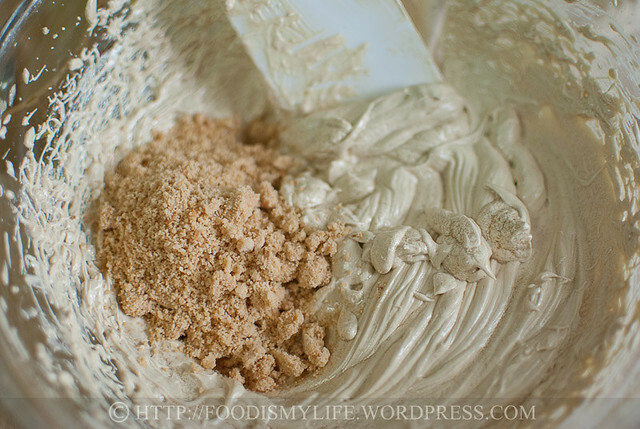 Add into the batter and mix it in. Divide the batter among the muffin-lined pans (or any cute pans you may have). Bake for 25 – 30 minutes until golden brown on top and a skewer inserted into the centre of the cake comes out clean. 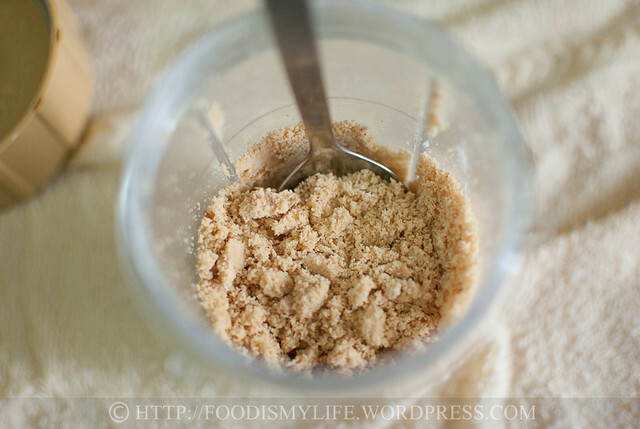 I’m going to list down the ingredients I used for this recipe as I’ve made quite a bit of changes, for the instructions, please visit Zoe’s blog! And do hop over here to see other bloggers’ beautiful bakes! 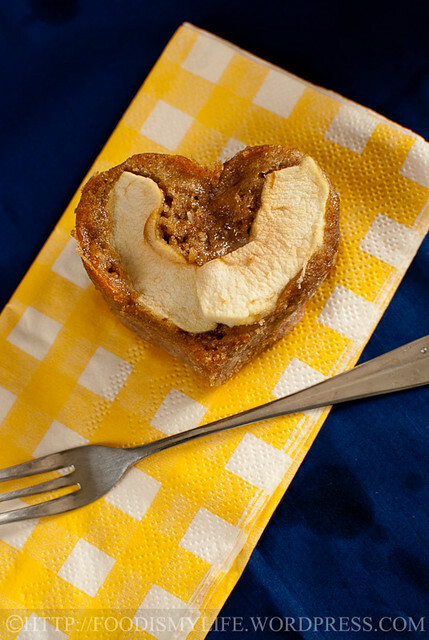 adapted from Coffee Cakes by Lou Seibert Pappas. Please visit Zoe’s blog for the instructions! Love those heart shapes! Great process photos. Thank you for the compliment Lena. Haha lucky I have my food processor to grind it for me, I’m always in awe as to how the people in olden days grind their own flour and nuts! Thank you for the compliments Mich! I think your cake looks so wonderful, love that mould of yours! I too couldn’t find pears and did thought of using apples instead, but that is out of the theme so I decided not to bake for this round. 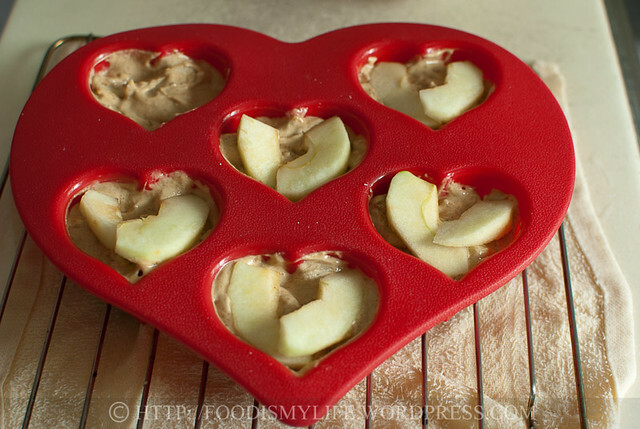 I love the heart mini muffin pan. I need to find me one of those! Love mini cakes and you have inspired me to try some sometime soon as I love the fact these are heart shaped! i always like to see you baking into minis..you always make them look so cute and pretty! i;m glad that i hv ground hazelnut in my fridge otherwise i would hv to grind them myself ..something that i dont always look forward to do! haha! i’m jealous of your heart shaped mould too! 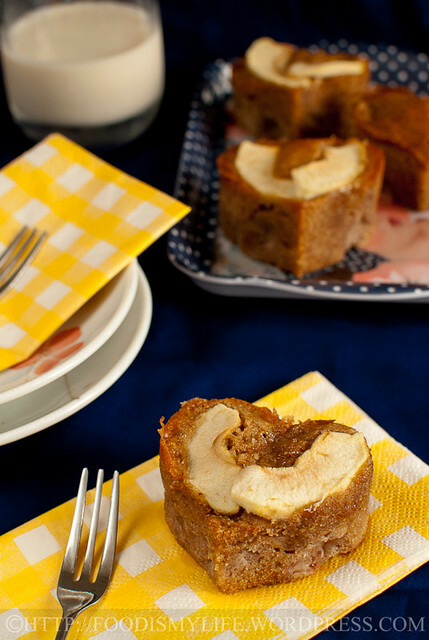 uber cute, and it just elevates your simple coffee cake to something so much more! 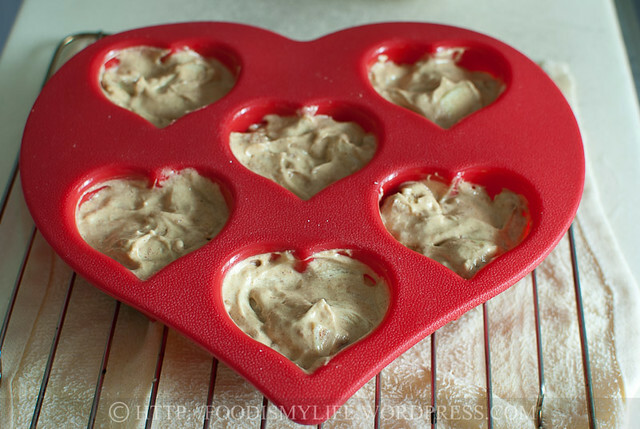 I love your heart shaped baking tin! The mini cakes are so beautiful! Thank you Anuja! I really should make more heart-shape desserts with this mould! Hey suts! Thanks for the note! Giant’s really far from my house.. but I’ll definitely go check it out when I can! Ahh I really should get shux to make the crumble for us next time! Thank you Chaya! 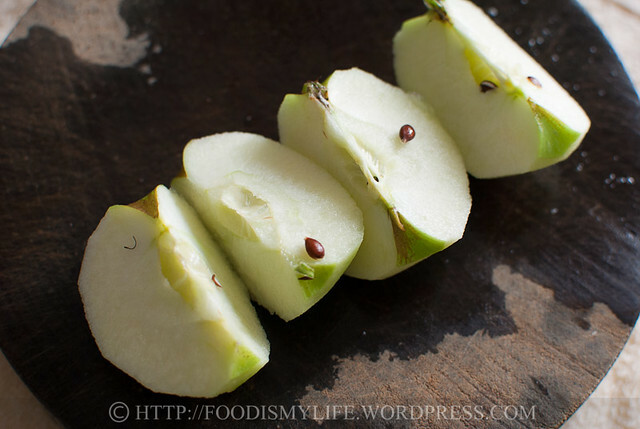 Wow I can’t wait to see all the pear recipes on your blog! Aww I wish I can send one over right now! Thank you Joyce! yea it’s a bit too moist but I really liked the hazelnut taste. 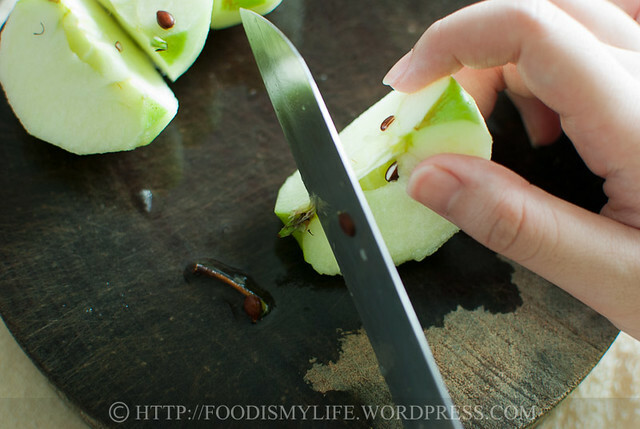 I think the moistness probably comes from the apples.. will try with other substitutions next time 🙂 Have a great week ahead! OMG your heart shaped mould is super cute. Love the idea of making mini cakes. hey jas check out giant for bosc or anjour pear(if really want it). it maybe seasonal…saw them early this yr in giant n they were fm USA. 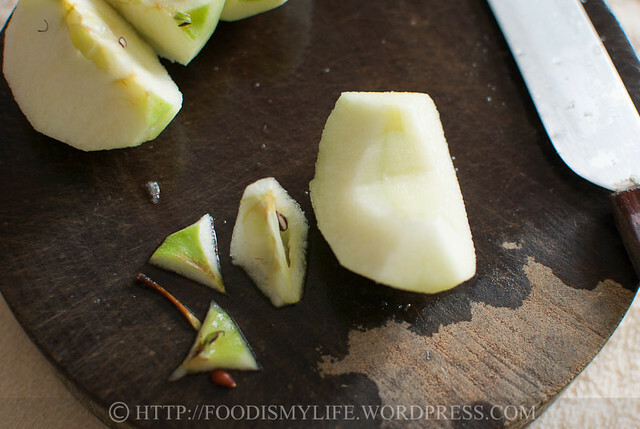 i prefer bosc cos they r sweeter n crunchier…nice for making pear crumble(e only thing that shux knows how to make). I have fallen in love with those molds. They make adorable little cakes. When I made this, I also thought apples but fortunately, my husband had brought back a large number of pears which were too ripe. I had to use them so I made the pear cake and then I made another pear cake and a pear crumble. We will be eating baked pear dishes, for a while. Thanks for teaching me the proper way to core an apple. A charming mini-cake. I’m sure it was just as tasty with apples instead of pears. Hi Jasline, Your mini cakes are so cute! Lovely silicone mould! 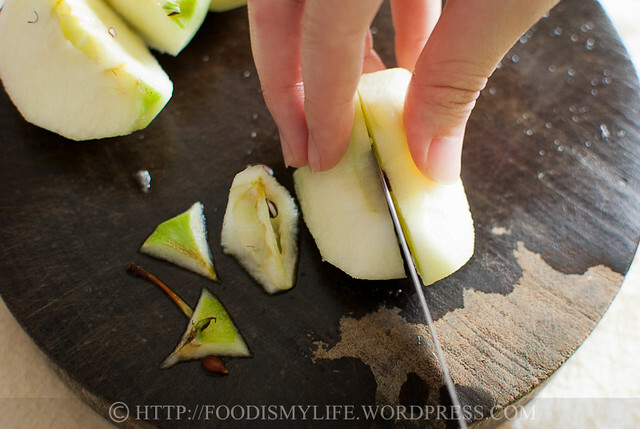 Great changes that you’ve made with chunks of apples in the cake! This cake is a little too moist for me too! My daughter likes it. Great bake! 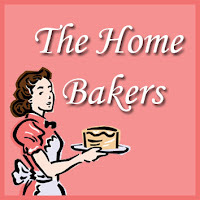 Looking forward to the next bake!